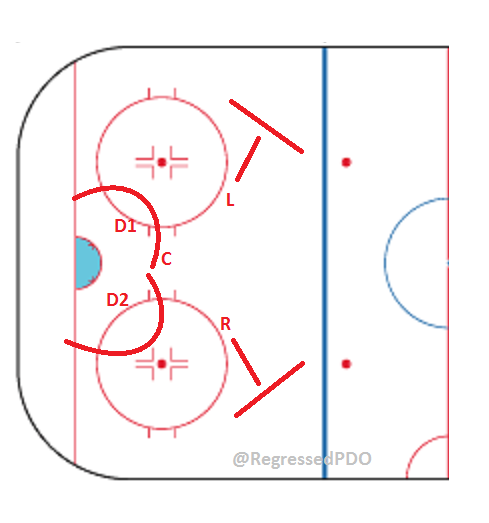 This is the basic set up of a 1-3-1 neutral zone forecheck. Without the arrows, it may not immediately look like a 1-3-1, but it is the motion of the players that creates this formation. F1 pressures the puck carrier to flush him out from behind the net or to take away a passing lane. In the illustration above, the puck carrier passes to a teammate along the boards in his own zone and skates out to support the attack. The strong side forward, F3 in this situation, skates up and confronts the puck carrier. The defenseman behind the strong side forward, D2 here, drops back in coverage to make sure he can clean up anything that gets through on any side of the ice. At the same time, D1 skates up to center to support F3, take away passing options and cover any puck carrier near him. 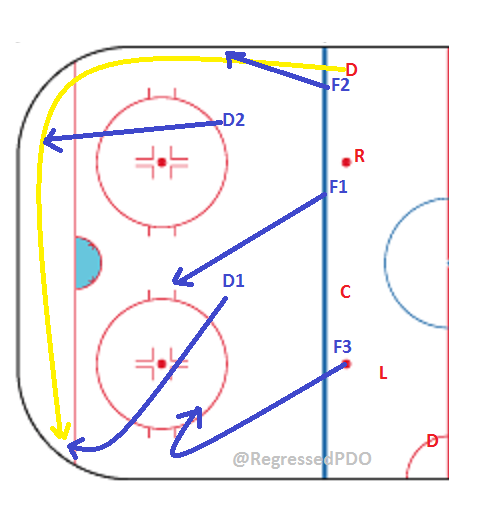 F2, over on the backside of the play, swings toward center and back to cover any passes or skaters in his area. It is difficult to make passes through this type of coverage, which is one of the reasons that F1 is allowed to be so aggressive. He does not have to immediately fall back to cover one of the lanes in the neutral zone because one of the defensemen has taken his spot. The breakout play above shows one of the vunerablities of the 1-3-1 forecheck, namely an extra pass from F2 to F3 to get in behind the “wall” and gain the zone. It is essential that D1 (forechecker) keep his gap tight to take away this passing option. The possibility of a 2 on 1 by F2 and F3 against the lone defenseman in the defensive zone is very likely if this pass makes it through. 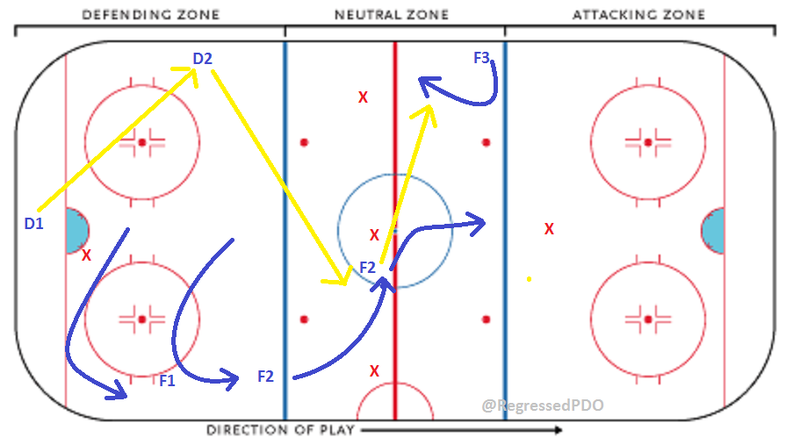 Another way to defeat a 1-3-1 forecheck is with a hard shot from the defensive zone to a forward in the neutral zone who simply redirects or tips the puck into the attacking zone. If D1, behind the net, is a very accurate passer, then he may elect to make this pass himself. 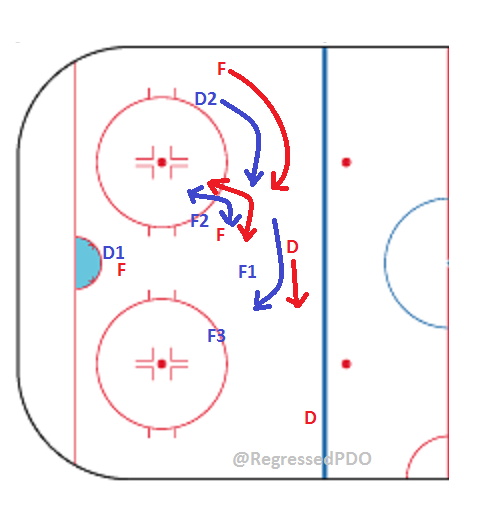 The safer way to do this is for D2, along the boards, to make a quick up pass to F3 who then tips the puck into the offensive zone and begins the chase to regain possession. 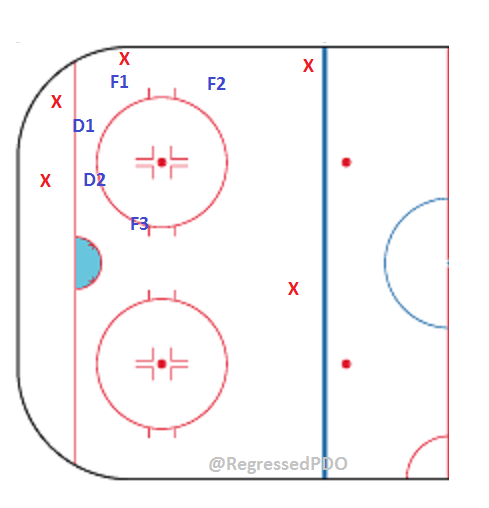 Another neutral zone forecheck commonly used, particularly by Chicago and Tampa Bay, is the 1-2-2 Wide. 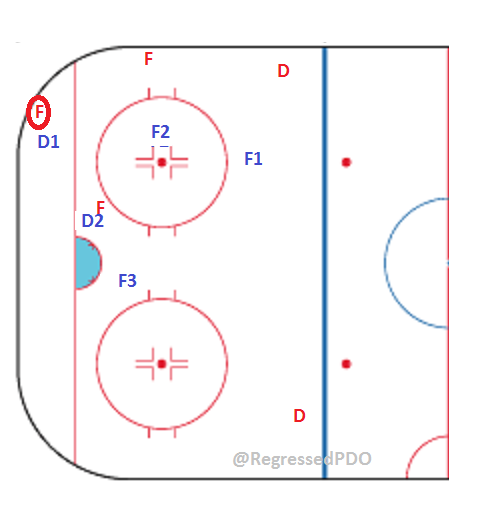 This system allows F1 to pressure the passes between the defensemen and take away a pass up the middle. As soon as D2 gets the pass and starts to move with it, F1 drops back to cover the middle of the ice. The forward covering the wide lane where the puck is being taken will step up to confront the puck carrier early in the neutral zone. The defenseman behind him will shift over to back him up. 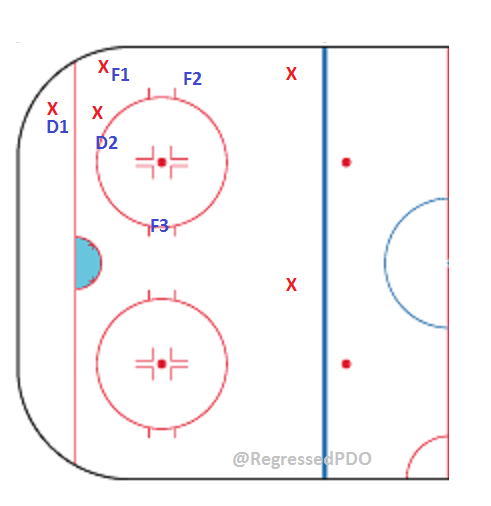 The other defenseman, D1(red) in this case, will shift toward center, while F3 will drop back to take away passing lanes and cover the forward in that lane. This formation does leave room for some creative passing, but if executed properly, often leads to a scramble for the puck along the boards or a dump in by R.
If the puck is dumped into the zone, most teams use a similar format to defend against the puck being recovered. One defenseman chases the puck to the corner and rims it around to his partner waiting near the other corner. F1 takes up a defensive position in the slot while F2 and F3 head to the boards on their respective sides ready for a breakout pass. 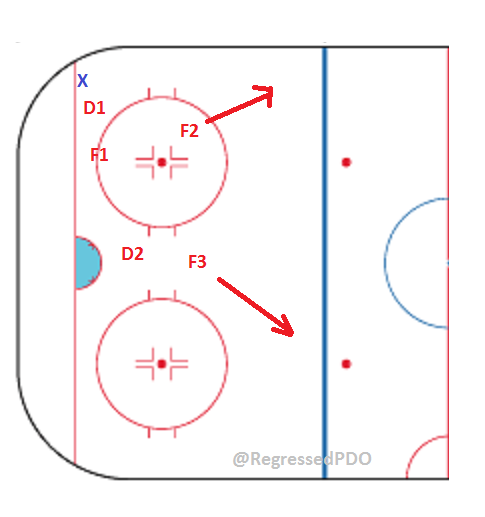 In the diagram above, F3 peels off the boards back toward the middle of the ice because the puck is going to the other side. If the puck is dumped in because one of the defenseman has stood up the puck carrier at or near the blue line, the look changes quite a bit. 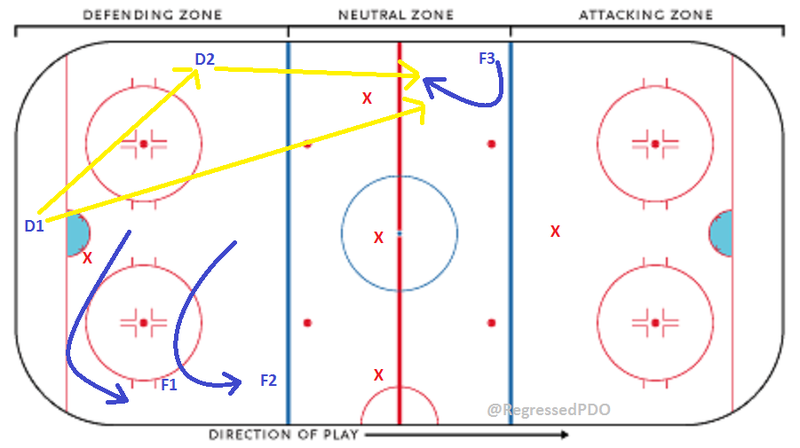 In this scenario, D2(blue) was the puck carrier and passed it to F2(blue) in the neutral zone under pressure from F3. 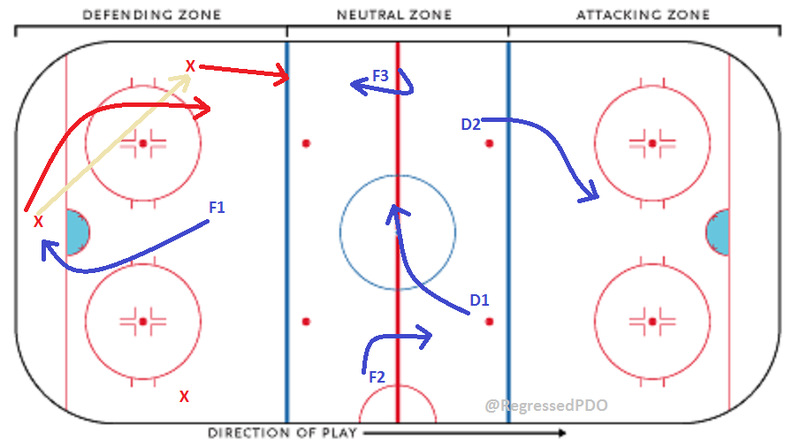 As F2(blue) skates into the attacking zone, he is met by D2(red) who forces him to dump the puck around the boards. Because D2 is committed along the boards, D1(red) speeds down to the end boards to collect the puck with F1(blue) hot on his heels. This is where hitting becomes a necessity on the offensive forecheck. 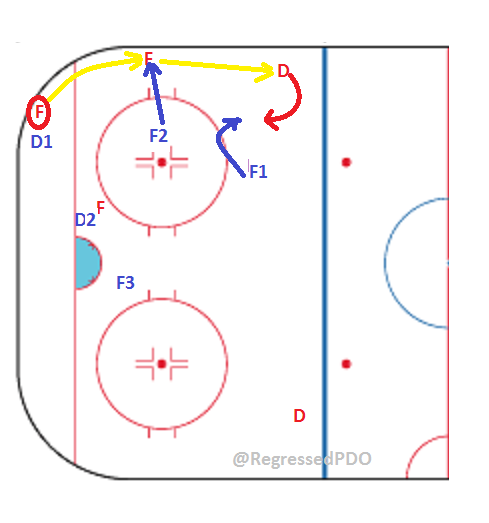 F1(blue) needs to “take the body” of D1(red) to either force him to make a poor pass or lose possession of the puck. 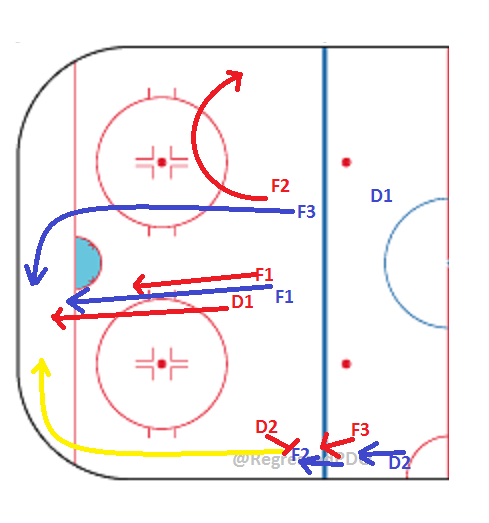 F3(blue) is coming in the opposite direction to collect the puck when it comes loose. D2(red) moves down the wall to support D1(red) while calling out the breakout play. F2(blue) moves down the wall to pressure D2(red) while F3(red) takes up a spot higher on the wall waiting for a breakout pass. F2(red) moves over to the other side ready for a breakout pass as well. In this situation, D1(red)’s best play is to play the puck back to D2(red) who then works it up the boards to F3(red) and out of the zone. If the team that dumps the puck in is able to regain possession, it often happens along the boards. How board battles low in the zone are handled by Chicago and Tampa Bay is very different. Tampa Bay frequently commits both defensemen to the board battles low in the zone. This leaves F3 as the sole guardian of the net front. Tampa Bay sticks with this formation even when only two offensive players are involved in the board battle with a third supporting. Obviously, F3’s job is crucial to the success of this formation. He is essentially responsible for everything on the ice outside of the board battle in the corner. This formation is effective when done properly because there is simply nowhere for the puck to go with four defensive players surrounding and squeezing the offense. 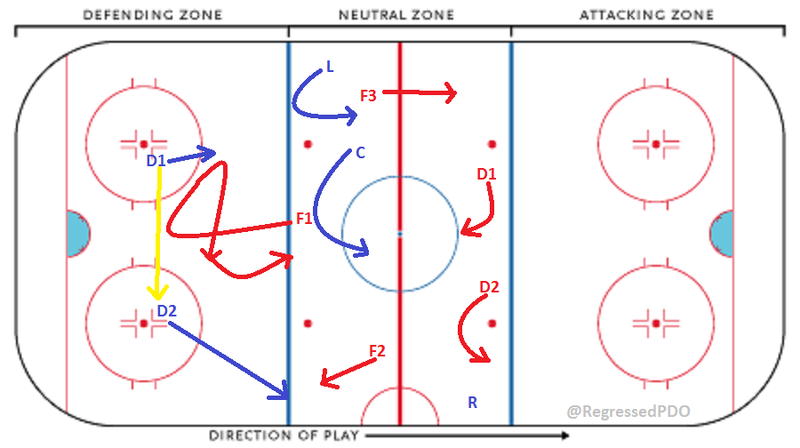 If the puck is able to be moved out by the offense, then the mad dash to get in position begins. Chicago works with a more traditional zone coverage when the puck is down low against the boards. D1 takes the area closest to the boards and tries to get the puck loose. F1 supports behind D1 to help recover the puck. D2 is responsible for the net and everything coming low on the backside of the play. F2 covers the strong side while F3 is responsible for the backside. Again, F3’s job is very important because if he loses sight of his man for even a moment, a scoring opportunity may well follow. The differences between Chicago and Tampa Bay when it comes to low zone coverage stem from something very simple: Chicago plays a zone defense and Tampa Bay plays man on man defense. This isn’t to say that there are no situations when these defensive systems change a bit, but for the most part, this is the fundamental difference between the teams. The F (forward) with the circle around him is the puck carrier in this case. D1 takes the puck carrier. D2 covers the forward closest to the net. F2 is responsible for the forward along the boards. F1 covers the strong side defenseman. F3 stays near the net front in the slot and covers the backside defenseman. F2 challenges his man along the boards as the puck is passed to him. F1 moves to challenge the pass and then stays with his man (D). Once D1’s man moves to the net front and play is moving closer to F3’s man, F3 releases from the low slot to get in a better position to challenge the backside defenseman should that become necessary. Every other player is still pursuing tight coverage including D2 who has released from the net front and follows his man wherever he goes, even if that includes going all the way to the blue line. Because of all of this movement, Tampa Bay tends to do quite a bit of clutching and grabbing in the defensive zone. Of course, there are rules that limit what a player can do in this regard, but since this breakdown is being done during the playoffs, those things probably will not get called unless they are really egregious. Again, Chicago runs a zone defense wherein the players are responsible for areas of the ice on the strong side and much larger areas on the backside. 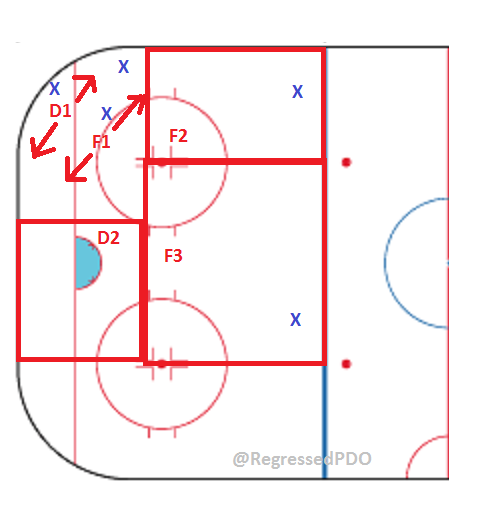 F2 and F3 are permitted to be very aggressive in challenging the defensemen at the points. If the puck is out high with the offense spread out, then Chicago’s 2-3 Defensive zone coverage is what you would traditionally expect to see. D1, D2 and C do not stray very far from their positions without a reasonable expectation that he can gain possession of the puck and with the knowledge that another player will cover his portion of the ice. R and L are given more latitude to move out and challenge the puck carrier in their areas of the ice. The defensive systems of these two teams should make for an excellent compare and contrast study throughout the series. Tampa Bay essentially treats their defensemen as if they were forwards in almost every aspect of the game and vice versa. The 5 man unit of players is not heavily differentiated when it comes to responsibilities virtually anywhere on the ice. Chicago, while sometimes offensively aggressive with the defensemen, has been fairly restrained in that regard this season due to personnel issues. Chicago has more structure to the defensive system it uses particularly when compared to Tampa Bay’s fluid approach to their systems.